When I wrote the typecast, I didn't have web access, but now I'm pretty sure it's an SM9. I have one just like that. It's a 9 I believe. Early 1970's. Very nice to use. 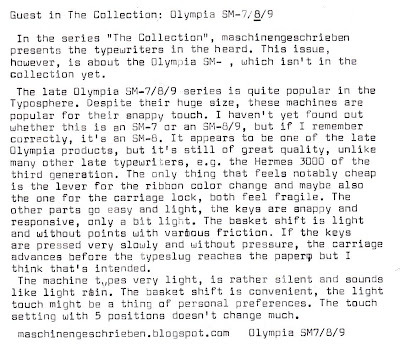 I get the impression most everyone in the typosphere either has or wants to get an SM-9, me included. Nice typewriters. I've got an SM-9, and my son has an SM-8. That's definitely either an SM-8 or 9. I think with the earlier models (like mine) the 9 had tab set keys on either side of the space bar. But they may have removed those from the later models. There's very little to tell between the two and really they're basically the same machine. 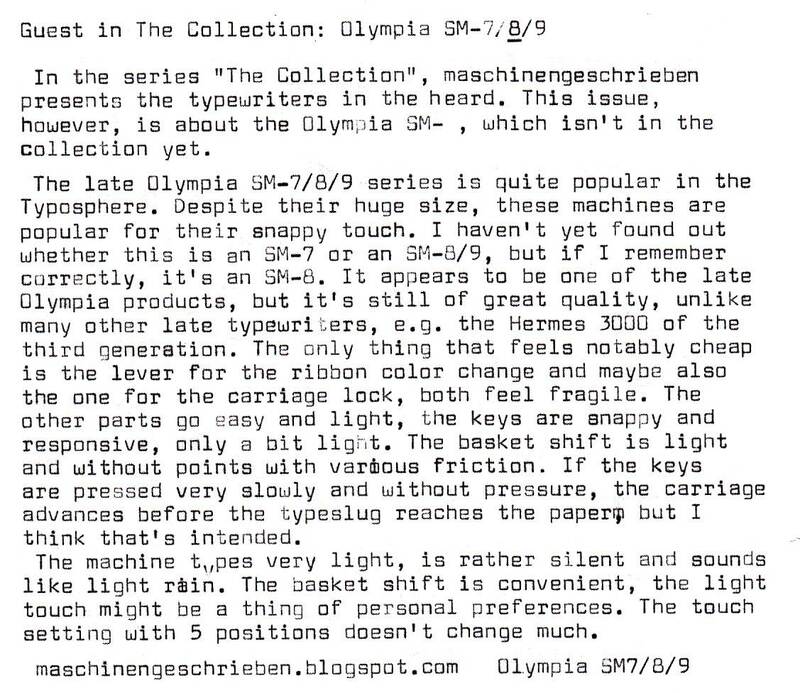 My SM-9 is one of the better typewriters in my collection. It's very snappy, but I'll agree that the touch is pretty light. I much prefer my SM-3. It had a more counter-balanced feel and individually spring-cushioned keys. I don't know why they got rid of that. Still, though, a good, tough, reliable machine. It's in my wish list for months... But no luck yet! It is a great machine. That's a lovely wide-carriage Olympia! Where did you borrow this from? I haven't had a chance to use the Olympia care typeface (funny name, but I think that's what they called techno) or see it in action, and it looks great! Very neat typecast.